Oke (...) but are you going to keep it like this or going to seperate them/ or offering the option to disable 2k4combos ? Some players want this, some says remove it. What should I do? I will make option for disabling/enabling.. I had this issue back in UNN09, but i forgot to mention you. Normally when you click, you dont see the beam, now you see the beam. Forcefire NewNet's original setup, I will analyze. Deepu: No problem with NewNet, maybe as140 scoreboard is broken? No i have give the bad way it come with LeagueAS140-Addon1g not working fine. 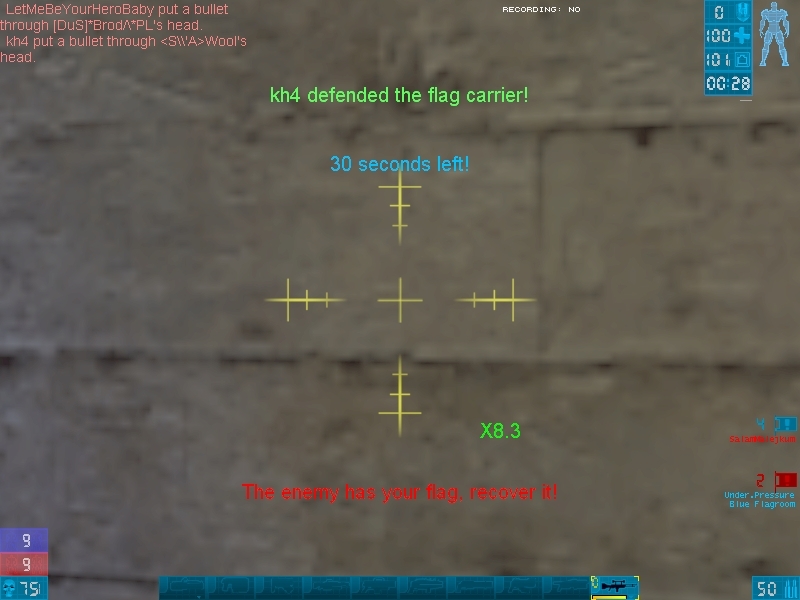 -> The useless "Assault the base" startmessage is replaced by "You are Attacking" or "You are Defending"
With Instagib or ZIG i shoot when i click to respawn. I see myself shooting 1 time when i click to spawn. 2/ Remove green HUD for back to the original one. EUT is come from old sniper server "Snipermania". you can't use it with newnet because it have a UTPure part. In it there is sounds ; one is when you are in air .... and shoot an other player in air to ( so the two in air ) if you kill him there is an announce. 1) Impact Hammer primary fire self damage: Impact Hammer selfdamage should always deal 54h damage, it does not matter if the user is charging or not the hammer. The Result should be 46/100 hp always. 2)Fast switching from a hitscan weapon(i dont know if it happens with projectile ones) to translocator will make it get stuck and the translocator in the HUD will be highlighted with yellow and you wont be able to use it or change to other weapon UNLESS you die or force it with a weapon bind. 3)Using the translocator too fast will make it not register properly sometimes, making it so you dont get translocated even tho the projectile animation shows the "disc" traveling. (i dont know if i was clear on this one). edit: is this the mutator i should use? here is our test RX8 server. Can't seem to get the SmartDM105 scoreboard to show with UN1. The scoreboard is visible in configs with UN09b. The F2 SmartDM info shows itself with UN1. I use UN09b only with Instagib. Checked UltimateNewNet09b INI and UN1 ini. Could not find any options for def.scoreboards. Do you use iptocountry and if yes how many serverpakages lines have you? When i say Do you use iptocountry and if yes how many serverpakages lines have you? With utserver436final and other ones. Test under 436 440 451b. Work fine with 228 packages ( not test more). As soon as I set iptocountry all configuration crash ucc.exe. If i remove for be to 55 it's ok..